Securing Predictable and Sustainable Financing for Peace in Africa August 2016 The Context 1. Africa continues to show remarkable resilience in weathering both global and regional challenges. Consolidating peace remains the foundation for the Continent’s continued progress and socio-economic transformation. 2. During the 50th Anniversary of the Organization of African Unity/African Union (OAU/AU) in May 2013, the AU Assembly of Heads of State and Government adopted a landmark declaration. They vowed that Africa would not bequeath the burden of conflicts to the next generation and made a commitment to end violent conflict on the continent by 2020. This was translated into the AU initiative: Silencing the Guns by 2020. AU High Rep. for Peace Fund Dr.Donald Kaberuka briefing the PSC on implemention of AU Assembly Decision on Financing AU. 1. Africa continues to show remarkable resilience in weathering both global and regional challenges. Consolidating peace remains the foundation for the Continent’s continued progress and socio-economic transformation. 2. During the 50th Anniversary of the Organization of African Unity/African Union (OAU/AU) in May 2013, the AU Assembly of Heads of State and Government adopted a landmark declaration. They vowed that Africa would not bequeath the burden of conflicts to the next generation and made a commitment to end violent conflict on the continent by 2020. This was translated into the AU initiative: Silencing the Guns by 2020. 3. The transition from the OAU to the AU came with high expectations. It offered a new vision for Africa at a time of renewed economic growth on the continent following years of economic decline, this was a period of rising real per capita incomes and improving human development indicators across the continent. 4. While Africa’s economic fortunes were beginning to improve there were important exceptions: Countries not at peace, or those emerging from decades of conflict and instability. The human and economic costs of these conflicts had adverse national and cross-border consequences: Increased numbers of refugees and internally displaced persons; the proliferation of small arms and light weapons, lost opportunities and wasted lives. In addition to these old conflicts new and more complex global security challenges emerged. 5. In response, and in line with the provisions of the Constitutive Act of the African Union and the Protocol Relating to the Establishment of the Peace and Security Council (PSC Protocol), the AU assumed political responsibility to address these challenges and developed its African Peace and Security Architecture (APSA). However, for a chronically underfunded organization, the financial and institutional requirements of assuming these new missions were perhaps underestimated. 6. Nonetheless the AU rose to the challenge progressively gaining experience, on what it can do alone and what is best done in partnership with others. It is important to underscore that, in responding to peace and security challenges, the AU demonstrated a significant comparative advantage not available to most other regions and organizations. This notwithstanding, it has become manifestly clear that, for Africa to maximize this advantage, adequate and sustainable resources and capacities must be in place. 7. In the peacekeeping arena, the AU has mandated and deployed seven (7) peace support operations (PSOs), most of them in contexts where the UN has been unable to deploy peacekeepers in a timely manner: the African Mission in Burundi (AMIB), the African Mission in Darfur (AMIS), the African Mission in Somalia (AMISOM), the AU Electoral and Security Assistance Mission to the Comoros (MAES), the African-led International Support Mission to Mali (AFISMA), and the African-led International Support Mission to Central African Republic (MISCA). 8. The AU Commission also provides strategic, political, technical, and planning support to operations authorized by the Peace and Security Council and carried out by regional coalitions of Member States, Regional Economic Communities (RECs), or Regional Mechanisms for Conflict Prevention, Management and Resolution (RMs). 9. Such support includes: The Regional Cooperation Initiative against the Lord’s Resistance Army (RCI-LRA) and the operation against Boko Haram undertaken by the Lake Chad Basin Commission and Benin- the Multinational Joint Task Force (MNJTF). Since 2015, the AU has also mandated the deployment of a total of 100 human rights observers and 100 military experts to Burundi. 10. The onerous nature of these missions is illustrated by the total cost of current operations which, for 2016, is estimated at $1.2 billion per year. AMISOM alone (with an approved strength of 22,126 uniformed personnel and 114 civilians) accounting for an estimated $900m per year. 11. Without the necessary financial means, the AU has had to rely on contributions from Troop Contributing Countries (TCCs) and external partners to implement most PSO mandates, and with the exception of AMISOM, has often had to transfer responsibility for its missions to the UN, typically within 12 to 36 months. 12. It is important to highlight the critical nature of the partnerships the AU has developed within the framework of APSA. The European Union (EU), United Nations (UN) and bilateral partners have all played a key role. There has been significant innovation and creative problem solving, which has been pivotal in meeting the continent’s peace and security challenges. Nonetheless all acknowledge that, with a few exceptions, overall support remains largely ad hoc and unpredictable. 13. Various high level reports and recommendations have noted that, as the nature of international peace and security threats has evolved, no single organization has the legitimacy and capabilities required to act alone. 14. While the AU has the mandate, experience and political will to deploy rapidly in order to deliver stabilization and counter-terrorism operations, it is unable to sustain such missions over the medium to long term because it lacks sufficient means. 15. Since the establishment of the Union in 2002, the AU and its RECs/RMs have demonstrated a clear comparative advantage in two particular types of situations: First, in Missions where offensive operations are needed and the UN is unable to deploy; and second, where the UN Security Council is unable to mobilize the requisite political consensus to initiate action. 16. The AU and its sub-regional organizations have developed significant institutional capacity over the past decade to undertake early warning analysis and conflict prevention. 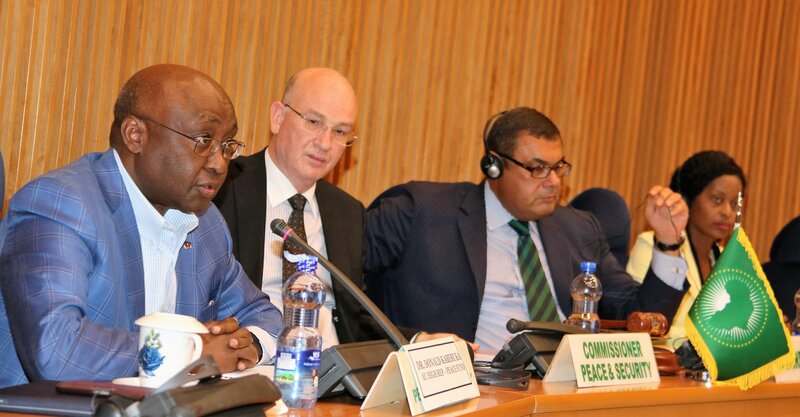 In this regard, the AU has built up an impressive toolbox for prevention and peacemaking. These include the Continental Early Warning System, the Panel of the Wise, Special Envoys, and ad hoc mediation panels, often comprised of sitting and former Heads of State. The AU also has experience in deploying liaison offices and "special political missions" in countries at risk of, or emerging from, conflict. 17. The Peace Fund (PF) was established in June 1993 as the principal financing instrument for the peace and security activities of the Organization of African Unity. As one of the five pillars of APSA, the PF’s legal basis is set out in Article 21 of the PSC Protocol. 18. The PF is to be replenished through financial appropriations from the regular AU budget (including voluntary contributions from Member States and arrears on assessed contributions). The Fund is also able to accept contributions from other sources within Africa, including the private sector, civil society, donations from individuals, and through appropriate fundraising activities. 19. During the Special Summit held in Tripoli in August 2009, AU Member States agreed to increase their contributions to the Peace Fund from 6% to 12% of the AU regular budget. During the 16th Ordinary Session of the Executive Council held in Addis Ababa, Ethiopia, in January 2010, it was agreed that this increase would be implemented over a period of three (3) years starting from 2011. 20. To date, the percentage contribution from the regular budget has only reached 7%. This is mainly because of high levels of arrears and late payments of Member States’ assessed contributions. While some AU Member States have made additional voluntary contributions to the Peace Fund, these payments are irregular and unpredictable. As a result, the Fund is highly dependent on external partners. 21. This highly unsustainable and precarious situation affects the AU’s ability to independently manage its peace and security priorities. The multiplicity of donor financing channels has, unsurprisingly, led to fragmentation and high transaction costs related to the numerous reporting requirements. 22. The urgent and strategic imperative of ensuring predictable and sustainable funding, not only in the area of peace and security but for the Union as a whole led the AU Assembly, in the 2013 and again in 2015, to prioritize the mobilization African resources to finance continental priorities. 23. Although It is well understood that preventive diplomacy is to be preferred to costly, complex peace keeping operations, to date the AU has not provided adequate financial support for this important undertaking. As a result, these critical activities are heavily dependent on the financial support of external partners, with more than 95 percent of the such activities funded by external partners, including conflict prevention, mediation, special envoys and special political missions. 24. There is general agreement that the current financing arrangements for peace support operations are neither reliable nor predictable, especially in the context of high-tempo combat operations. While partners have demonstrated much flexibility and innovation, there is consensus that the current financing arrangements are unsustainable. 25. The EU has played a key role in supporting AMISOM. Other bilateral partners have provided (a) direct bilateral financial contributions, to the AUC and to Troop/ Police Contributing Countries/(TCC/PCCs) deployed in missions; and (b) in-kind contributions to specific missions through the provision of critical components such as communications systems, strategic airlift, etc. 26. The UN has been a key partner providing support in three principal ways: First, hybrid missions where the AU retains a political role in the strategic management of the mission, but where the day-to-day running and the financial costs are fully funded from the UN peacekeeping budget through the normal process of assessed contributions (UNAMID). Secondly, deploying a UN support mission to provide direct logistical support to key elements of an AU mission (UNSOS in support of AMISOM); and thirdly, through UNSC authorized, UN-managed Trust Funds, which are dependent on voluntary contributions. 27. 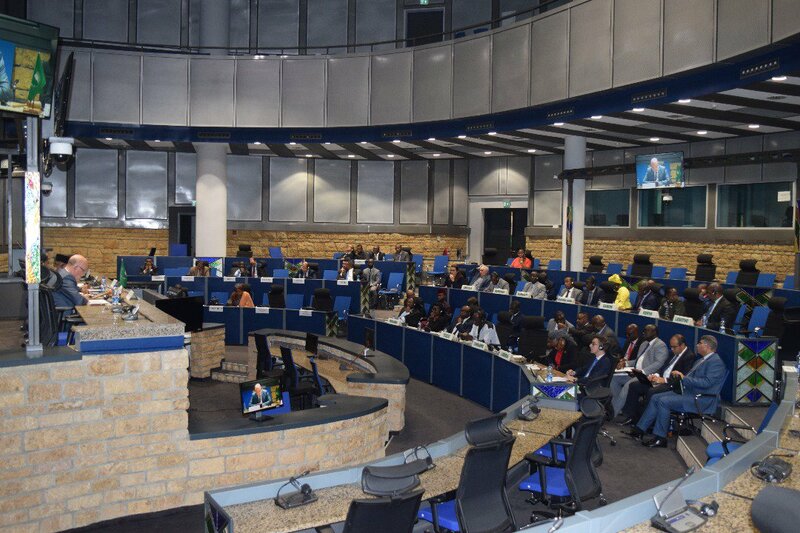 It is important to highlight the significant contributions made to peace support operations by AU Member States/TCC/PCCs from their national budgets, e.g. the provision of uniformed personnel and equipment. Some of these costs are reimbursed, through payment of stipends to deployed uniformed personnel and reimbursement of contingent-owned equipment (CoE). However, AU Member States also carry the costs of preparing their forces, the capital cost of replacing equipment, responsibility for the lifelong care of wounded and disabled personnel, as well as the cost to societies and families of lives lost in the service of maintaining international peace and security. 28. The AU has consistently argued for predictable and sustainable financing through UN assessed contributions for AU-led peace operations that the UN cannot itself undertake, but which are regarded as critical for the maintenance of international peace and security. In this respect the recommendations of the High Level Independent Panel on Peace Operations (HIPPO), which are consistent with the AU’s own Common African Position, are pertinent and ground breaking. It is to be recalled that the Report recommended that "UN assessed contributions should be provided on a case by case basis to fund AU PSOs authorized by the UN Security Council "
29. The decision by the AU Assembly of Heads of State and Government, in 2015, to take financial responsibility for 25% of peace activities by 2020, is a major milestone. Of equal significance is the decision to reinvigorate the Peace Fund and appropriately endow it to finance preventive diplomacy, mediation activities, build readiness capabilities, maintain a Crisis Reserve Facility and contribute to peace support operations when that becomes necessary. 30. Article 21 (4) of the PSC Protocol foresaw the need for the creation of a replenishable Revolving Trust Fund as part of the Peace Fund (PF). This has never been established and, as a result, the AU does not have a reserve facility to finance responses to unforeseen crises. It is expected that once the Peace Fund is optimally operational this revolving facility will become fully functional. 31. The financing challenges outlined above have had important unintended consequences. High levels of donor dependency have weakened ownership in this critical area of the AU’s mandate and led to strategic drift, as the AU Commission (AUC) increasingly focused on externally financed activities. 32. Both AU Member States and partners have expressed concerns with the lack of adequate accountability mechanisms, that reduce the scope for additional support and make multiple reporting requirements inevitable. Significant financial management and administrative reforms are now underway within the Commission but it may be some time before the efforts bear fruit. 33. Progress is being made in addressing the AUC’s capacity to manage and provide oversight and accountability in the use of its funds irrespective of the source. However, there is still some distance to go in strengthening fiduciary management, accountability, results and effectiveness. In the interim, it is therefore necessary to put in place Peace Fund governance and management systems that combine AU political oversight with robust fiduciary systems including independent fund management. 34. The high cost and complexity of AU PSOs places a premium on greater investment in Mediation, Preventive Diplomacy and Institutional Capacity. It is imperative that the AU Peace Fund take primary responsibility for financing this core operational priority. While partnerships will still be needed, AU Member States should primarily fund these relatively low cost but high impact activities. Table 1 indicates the costs of such activities in 2016. 35. It is vital that the AU has the minimum ability to respond to sudden unforeseen crises. It is therefore important that the Revolving Trust Fund envisaged in Article 24 (1) of the PSC Protocol is now formally established as a Crisis Reserve Facility within the Peace Fund. As in the area of preventive diplomacy and mediation, this Facility should be primarily financed by AU Member States. 36. Establishing the full cost of AU-led PSOs has been complicated by the multiple and ad hoc financing arrangements that are in place. Contributions in kind and those provided from TCC national budgets are not routinely captured, yet they constitute a core element of the financing of AU-led PSOs. The PSO budget costs provided in this section are estimates based on the available data. 37. 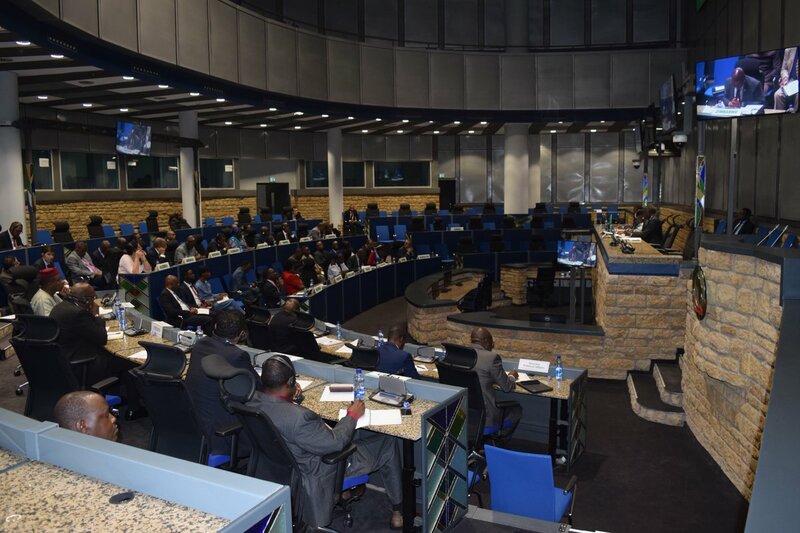 A number of scenarios, were developed to analyze the financial implications of the 2015 Assembly decision to pay 25% of the PSO budget: Ultimately, it was agreed that the scenario described as "Middle Scenario" is the most realistic. This excludes AMISOM, but includes the RCI-LRA, MNJTF and Burundi observer missions. In addition, it assumes the potential deployment of two new missions, totaling 15000 uniformed personnel. The scenario also includes a 5% adjustment for inflation over the 5-year period. 38. Under this scenario, the estimated cost of all AU PSOs in 2016 would be US$772m. Although the baseline on which this is determined remains an estimate, it is the most realistic one in the current circumstances. 39. In its ground-breaking decision on the Financing of the Union, the July 2016 AU Assembly decided to institute a universal levy of 0.2% on eligible imports (Assembly/AU/Dec.605 (XXVII) whose technical details appear elsewhere. 40. The 0.2% levy will endow the Peace Fund with $325m in 2017 rising to a total of $400m by 2020 against an estimated overall Peace Fund budget of $302m in 2020. Any unutilized balances will be held in the Crisis Reserve Facility to enable rapid response to unforeseen crises. 41. Recognizing that the AU regions and RECs/RMs have exercised much leadership and have often constituted the first line of response, the Peace Fund will support regional responses, in accordance with PSC and other AU Policy Organs’ decision making processes. 43. Alongside the above the Crisis Reserve Facility (Revolving Trust Fund) provided for by Article 21 (4) of the PSC Protocol on Peace and Security) will be established within the Peace Fund to enable rapid responses to unforeseen crises, from any unutilized balances. 44. The AU Policy Organs, particularly the PSC, have the political authority to guide the activities of the Peace Fund. The AUC Chairperson supported by an Executive Management Committee will oversee the Fund’s Operations. 45. A Board of Trustees will be put in place to ensure strategic coherence, enhanced governance, financial and administrative oversight of the PF. External partners to the Fund will be invited to nominate one or two representatives to the Board. An Independent Evaluation Group will provide periodic evaluation on the use and impact of the Fund. A dedicated Peace Fund Secretariat will be established within the Commission to manage day to day operations and will report to the Executive Management Committee. An independent Fund Manager will be recruited to ensure the highest standards of accountability and compliance with fiduciary rules and procedures in the management of the Fund. The detailed proposals are contained in Annex 1. 46. Strengthening collaboration between the AU and RECs/RMs is a key operational and strategic priority for the Peace Fund. To this end, the RECs/RMs will be invited to participate in the fund design, operational procedures and eligibility to ensure appropriate modalities for financing effective responses to their needs and priorities. 47. While AU Member States are primarily responsible for financing the Peace Fund, partnerships will continue to play a vital role in supporting peace and security activities of the African Union. Deepening co-operation with partners, both traditional and emerging ones is therefore imperative. The Peace Fund proposals in Annex 1, which emphasize improved prioritization and governance, will provide a vehicle as well as an opportunity, to improve the co-ordination and overall effectiveness of existing and future partnerships. 48. Engagement with emerging partners will be central to the operationalization of the Peace Fund. It will be important to understand their systems and procedures, typically emphasizing bilateral and direct forms of support, in order to develop a strong basis for collaboration through the Fund. 49. The AU’s proven ability to act as ‘first responder’ is a critical element of the evolving international peace and security architecture. Based on this shared understanding, both the April 2015 Common African Position and the HIPPO report stressed the need for a strategic-level AU-UN partnership. 50. This enhanced form of partnership must necessarily be based on the two organizations’ respective authorities, competencies and capacities. It must also observe principles of burden-sharing, consultative decision-making processes, comparative advantage and a mutually-acceptable division of labor. The AU-UN Joint Review of mechanisms that is underway should provide an opportunity to enhance the partnership building on the lessons identified. 51. In this regard, it is important to highlight the July 2016 AU Assembly decision (Assembly/AU/Dec.605 (XXVII) para 5 (b) (iv)) which called for a way forward on how AU led missions can access UN assessed contributions, following the HIPPO Report recommendation. Annex 2 proposes a possible consultative decision making process to that effect. 52. There should be no illusion as to the political complexity of this matter. However, to the extent that there is agreement on the urgency of improving the international peace and security architecture to address today’s security challenges, arriving at a shared solution is a strategic imperative for both the AU and the UN. 53. Ensuring that all AU missions, including both those missions supported by UN assessed contributions as well as those financed through other means, are compliant with international human rights and humanitarian law as well as accepted international norms of conduct and discipline, is an obligation applicable to the AU and all its Member States. 54. In this regard, both the UN and AU missions have faced challenges in recent years and must remain vigilant and strive for improvement. Progress has already been made within the AU to ensure that its missions are in compliance with international legal obligations. However, much of this work has been ad hoc and must be institutionalized. Annex 3 addresses this in detail. 55. AU Member States have the primary responsibility for funding the Union. That said, the private sector has an interest in, and stands to benefit from, improved peace and security on the continent. It is also worth recalling here the critical role of the private sector during the recent Ebola crisis. They led from the front and were critical partners to the AU. Leveraging financing from this sector to support well delineated activities of the AU Peace Fund such as preventive diplomacy remains a top priority. A well designed and adequately resourced Peace Fund will lay a solid foundation for a longer-term engagement with the business community. 56. Financing peace and security in Africa on a sustainable basis is not only an African priority but a global strategic imperative, given the complex and interconnected nature of threats to international peace and security today. The July 2016 AU Assembly Decisions on the Peace Fund are a powerful demonstration of the determination and commitment of the AU and its members to assume primary responsibility to fund the Organization’s peace activities. This provides the opportunity to build new partnerships with traditional and emerging partners, International Organizations, the private sector and civil society, and to pool our strengths in order to meet the emerging global threats. 57. The African Union and its Member States are already taking the lead in confronting challenges which other institutions are not able to address. With an AU Peace Fund fit for purpose, the Continent, together with its partners, will establish a foundation for creating a more responsive international peace and security architecture. The complexity of the issues, ranging from funding, to crafting new partnerships with the UN, cannot be underestimated and will demand political will and a paradigm shift. A journey of a thousand miles begins with one step. It is now time to take that step.